This is probably blasphemy, but I’d have to put The Exorcist among the most over-rated horror films of all time. That may not entirely be its own fault. When I was active in horror fandom back in Britain in the nineties, it was infamously refused any kind of release on home video for 15 years. This was at the behest of repressive BBFC chairman James Ferman, who stated, “We have too much evidence of teenagers being disturbed by it in the cinemas, particularly girls.” Good job there, Ferman: managing to play both the “Think of the children!” pro-censorship card, while simultaneously being sexist. It wouldn’t be approved until (virtually immediately) after his departure in 1999. Inexplicably, Britain did not then collapse under a tidal wave of impressionable youth, masturbating with crosses. For this, and a number of other reasons, which I may eventually get around to listing in an article of their own, I am inclined to file The Exorcist alongside Night of the Living Dead. Both films are more influential on the genre, than they are particularly good. They deserve a great dead of respect for their breaking of new ground, and The Exorcist was arguably the last horror film to be nominated for the Best Picture Oscar [although that depends on how you would categorize Jaws, Silence of the Lambs and Black Swan]. But it’s ground on which others have then built, admittedly with varying degrees of success. The zombie film has become perhaps the most-common theme in horror recently. 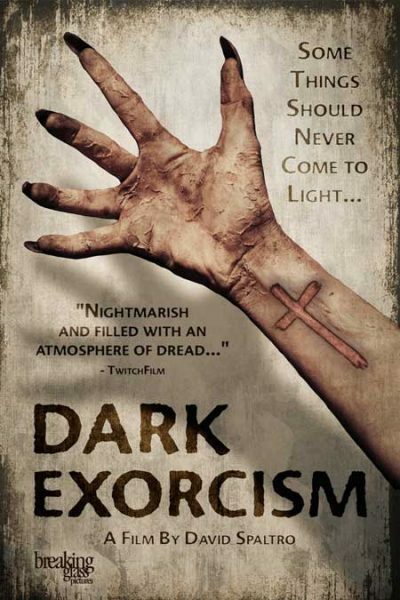 But over the past decade, beginning with the success of The Exorcism of Emily Rose in 2005, there have been quite a few to take some inspiration from Friedkin’s shocker. Which brings us to Dark Exorcism, called by its director, “A lovingly bloody Valentine” to The Exorcist, as well as the works of Stephen King and John Carpenter. Obviously a smaller-budget production, its cast numbers little more than five people, though this is never an issue. The victims of the supernatural phenomena are mother and daughter Joan (Ryan) and Bethany Mills (Folsom). Their husband/father died of bone cancer; Bethany is also recovering from injuries suffered in a car-crash, and spends much of her time painting in the basement. However, the family is increasingly plagued by inexplicable phenomena. These begin with cold spots, then escalate through electrical disturbances and on to full-on physical attacks, with Bethany the focus. For help, they turn to veteran researcher Lois Keane (Horrigan), who has investigated hundreds of alleged paranormal incidents over the years – and found precisely three which stood up to scrutiny. She is accompanied by graduate student Veronica Carpenter (Justinger), who is doing research for her thesis, and also coming to terms with a recently discovered pregnancy and an over-attached boyfriend. As they look into the Mills’s case, Keane quickly realizes this is not just her fourth truly inexplicable situation. It’s no simple haunting either, being a fully-fledged case of demonic possession, with “true evil” having taken up residence inside of Bethany. To get the negatives out of the way first, I did find a couple of issues with the script. Keane’s conclusion that this is a “true case,” seems extremely rapid, especially for someone who has found prosaic explanations in 99% of her previous investigations. You’d expect her to be the Scully to Carpenter’s Mulder, yet it’s the other way round, the rookie last to be convinced of the phenomenon’s authenticity. It also seemed odd, nobody then made any attempt at all to contact or convince spiritual authorities, such as the Catholic Church. They’re the pros in this area, after all. Once you’ve decided you’re dealing with the very dangerous real thing, rushing ahead and carrying out an exorcism yourself, seems like trepanning a friend’s skull because you heard they have an aneurysm. That said, just about everything else works, and works beautifully. The main positives are the performances: save for Veronica’s whiny boyfriend, these are all both likeable and believable. Take the lengthy first conversation between Keane and Carpenter, a hefty gob of exposition and scene-setting, which could have bogged the film down before it got going. Yet it remains interesting – not just due to the actresses, also because the script is written to ask questions the audience wants answered. However, the best of the four leads is Folsom, who has to perform two, utterly opposite roles: Bethany, and the demonic entity inhabiting her, who is gradually destroying its host from within. As things degenerate, the difference becomes so radical, it’s hard to believe you are not watching separate actresses who happen to share a physical resemblance. The technical elements are equally strong, right from opening credits which state this is not your average direct-to-video horror. Spaltro, wisely, avoids relying too much on obvious special effects. Indeed, when they do show up, for the climactic exorcism, you almost wish they hadn’t. The film had been so thoroughly grounded in its dark reality to that point; ot’s more effective when retaining the connection to our everyday world. Cinematographer Gus Sacks does great work there, hiding horrific things in the shadows, and showing as much by the reactions to those things. I’d also single out for praise the overall audio design of the film, including both the music by composer Fritz Myers, and the work of sound editor Carlos Martinez. Despite being agnostic at best, I’m generally a fan of religious horror; the battle between good and evil at its core never gets old. However, I suspect that my lack of faith probably means I react them differently than a “true believer” would. I’m simply looking for an interesting story, well told, rather than any life lessons or dogmatic affirmation of preexisting ideology. By my criteria, Dark Exorcism succeeds very well. Under the less generic title of In the Dark, this was originally a submission to our film festival, and it’s a shame we weren’t able to arrange a screening, as this certainly was among the best entries received. The good news is, unlike many great films which never make it off the festival circuit, this is getting distribution through Breaking Glass Pictures, and will be available on DVD and on-demand through ITunes, Google Play, etc from September 13. It’s definitely worth a look. Final, random note: on typing “Dark Exorcism” into the IMDb, you currently get two hits. This film, and Shark Exorcist. The latter’s plot is, “A demonic nun unleashes holy hell when she summons the devil to possess a great white shark.” Sounds awesome.